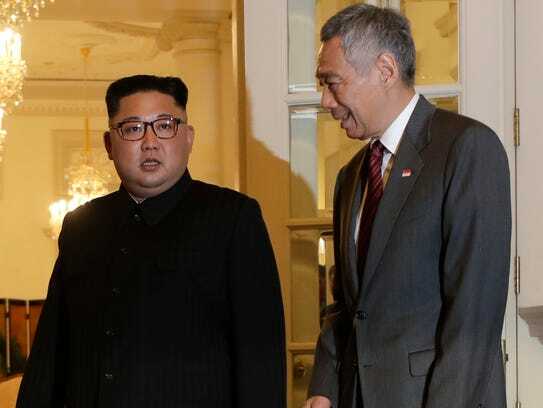 SINGAPORE – A day after arguing with western allies at the G-7 summit over trade, President Trump landed in Asia on Sunday prepared to declare victory in talks with nuclear-armed North Korea — regardless of what happens. Even if Kim offers only "a fine-sounding rhetorical commitment, and maybe a few missile surrendered or some site closures," he said, Trump will "market this thing as something extraordinary for his voters back home." Few people expect Kim to commit to what some Trump administration officials call "CVID:" Complete, verifiable, and irreversible dismantlement of nuclear weapons programs — certainly not at this meeting, and perhaps not ever. Olivia Enos, policy analyst with the Asian Studies Center at The Heritage Foundation in Washington, said "a successful summit would move beyond mere statements about denuclearization." Security is tight ahead of the summit between two unpredictable men who in the past have threatened to destroy the other's country during the stand-off over North Korea's nukes. A government described as authoritarian by its critics has clamped down on protests thought strict loitering laws and a difficult permitting process. Still, some Singaporeans are getting into the swing of things. Trump and Kim lookalikes held a summit of their own at a local shopping mall, while one bistro is offering a libation known as the Trump-Kim "Bromance:" Beer, tequila, diet Coke and the Korean distilled rice liquor known as soju. While fighting a trade war with allies, Trump now brings his America First negotiating style to the deadly topic of North Korea's nuclear weapons.